Shopping is definitely PART AND PARCEL of life! PART AND PARCEL is an online clothing store based in Singapore, formed through the love of providing fabulous apparels of exceptional quality at affordable prices. The styles brought in are kept classic and timeless, occasionally spiced up with unconventional cuts, unique prints, trendy elements, different fabric textures, pop colors and statements accessories. By the way, there is currently 14 days free return for Singapore orders until 31 July 2013! Also, a new Menswear section will be launched this month! 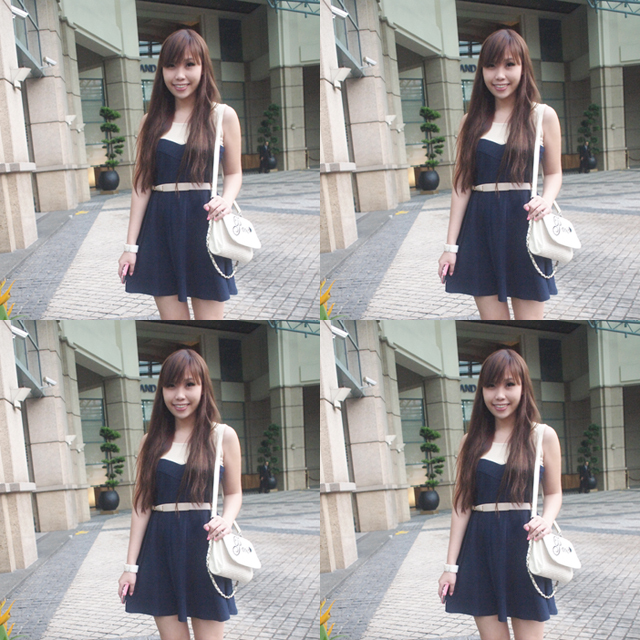 I wore this navy dress to Jipaban's Lollipop-up X Blogger Bazaar and it was a comfortable piece! While the material is definitely of good quality, I also love the simple and versatile design. Check out the exclusive label too! Join the mailing list and follow PART AND PARCEL on Facebook to stay up to date on latest arrivals, promotions and other special events!